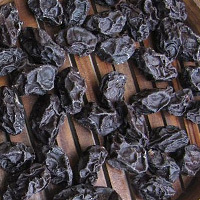 Dried prunes also called dried plum is a dried fruit made from prunes that is high in dietary fiber, vitamin B6, and potassium containing the same amount iron content as spinach. More than half of the fiber containing in dried prunes is water soluble dietary fiber. Eating 130g of dried prune gives you your daily recommended potassium. The calories in Dried Prunes per 8g(1item) is 19 calories. Dried Prunes is calculated to be 235Cal per 100 grams making 80Cal equivalent to 34.04g with 4.99g of mostly carbohydrates、0.2g of protein、0.02g of fat in 8g while being rich in vitamins and minerals such as Copper and Vitamin B6.